Three friends and I enjoyed a three night stay at this Moving Mountains chalet, and it was an awesome trip from start to finish. In addition to great accommodations, the amenities were out of this world - a coffee bar, hot tub, robes and slippers, a game room, TVs, wood burning stove, a giant kitchen with all the cookware and dishes you could possibly need, and more. We especially appreciated access to the Moving Mountains shuttle to get around Steamboat, and nothing could beat the in-house chef who came to cook for us one evening. He put out appetizers, we popped a bottle of bubbly, then sat in the hot tub and chilled until the main course was ready. Truly, it was an awesome stay. And that doesn't even count the night skiing, ice climbing, snowboarding, hot springs-ing, and shopping we did on our trip. A group of 14 friends were headed to Steamboat for my birthday, and found several Moving Mountains houses on AirBnb. We booked one, and ended up getting upgraded a few days before with the help of an incredibly friendly and kind employee Raul. He arranged for us to have a late check out Sunday, and sent us very detailed instructions on directions, and everything we needed to know about the house. The house was unbelievable - excellent condition, beautiful, came with robes and slippers, a giant hot tub, breathtaking views on multiple balconies, a wet bar, plenty of bathrooms and bedrooms, every kitchen appliance you could ever need...my friends and I felt as if we became rich over night. I'll be talking about that trip and that house for awhile. There's no reason to stay anywhere else in Steamboat. If you do - you're missing out. Note: for 14 people, a 5,000 sq. foot house that slept 16 in September was $82/per person for two nights. The price was right and the stay was even better. It was so nice we booked the Creekside Chalet for the second year in a row. This is an outstanding place to stay. Great kitchen, hot tub and easy access to Thunderhead mountain. For the money I would pass on this house. 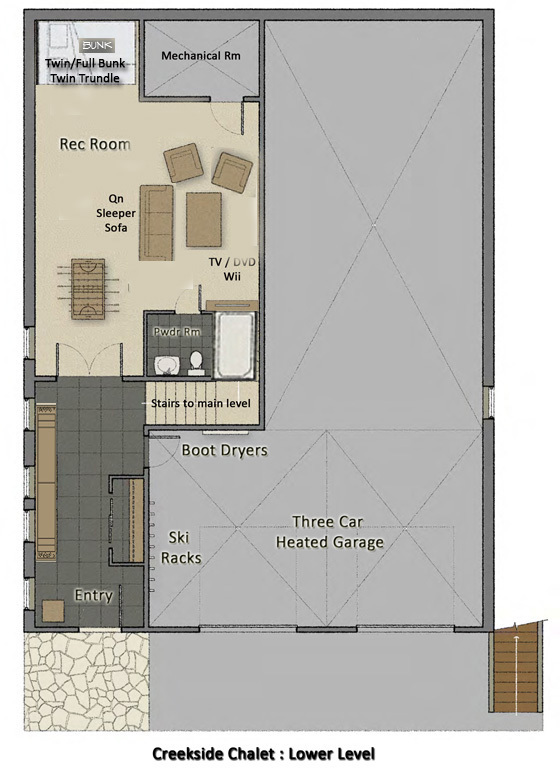 Mainly didnt like the floor plan, no views to speak of, and had cold water in the master bath the last 2 days. On the plus side, the hot tub was great, it was easy to get to, and management resolved some small issues I had promptly. It could not have been better! The home owner and Moving Mountains have thought of everything that a large family or small group would need. Everything was in excellent condition and working properly - there simply was no issues or needs. 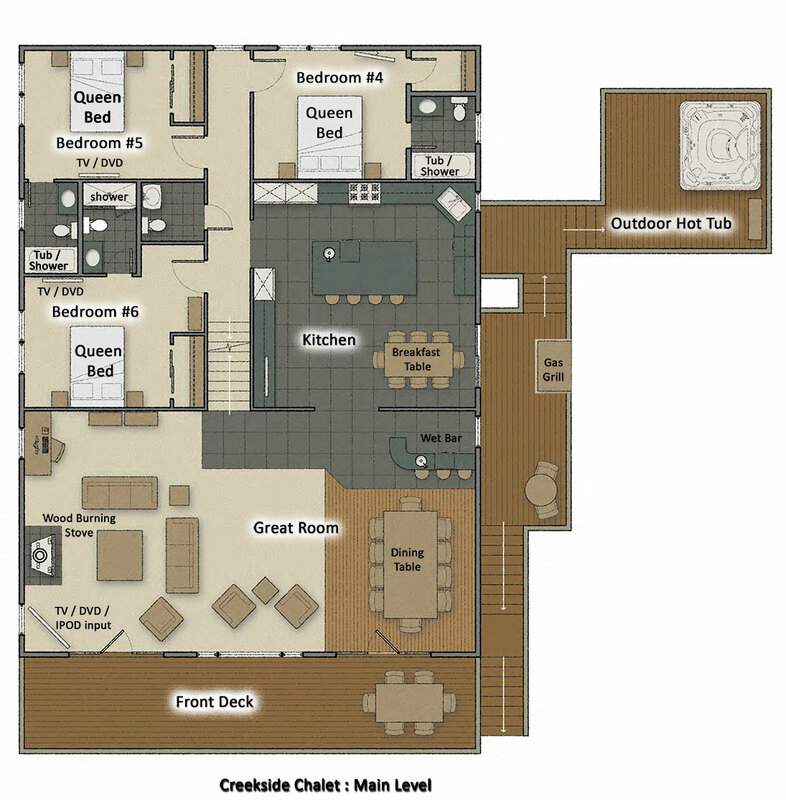 The layout of the bedrooms (each with their own bath), multiple living rooms and large decks gave our large extended family plenty of room to spread out. We had a six month old child with us and rented several infant items (Excersaucer & baby bath) from Moving Mountains, which were essentially brand new and in perfect condition. The home is close to ski mountain and only a short 3-5 minute drive to downtown, lot's of restaurants and shopping close by for groceries etc. The home sits right on the edge of the National Forest with trails to hike or bike adjacent to the property. Moving Mountains were wonderful suggesting places to go and things to do. We hated to leave and will definitely be back! We have skied Steamboat for many years and were delighted to find Moving Mountains for our March trip last year. We loved the Creekside Chalet - perfect for our family with lots of extra touches like board games or movies, and a properly equipped kitchen, that really made it feel like home. The home was beautifully clean, well maintained and the shuttle service from the door made ski access a breeze. Highly recommended! When we decided to take all 16 of our family members on a Christmas/new year ski trip, we needed a home that could not only sleep us all but could provide room and equipment to cook meals and give kids space to play (away from ski worn parents). Creekside had it all including location...lifts were extremely close (especially to thunderhead lift) and fireworks were visible from the warmth of the living room. Loved the real wood burning fireplace and the huge private spa. We'll be back guaranteed! Let me first start by saying that after 8+ years of extensive traveling this is my first ever review... I recently had the pleasure of staying at the Creekside Chalet with 14 friends and was blown away by both the home and level of service provided by Moving Mountains. I have read other reviews that have raised concerns with the location and yes it is definately shuttle ride to the gondola service but as a group we walk both to and from the Elk Head Express on several occassions so for us it didnt have any real impact. 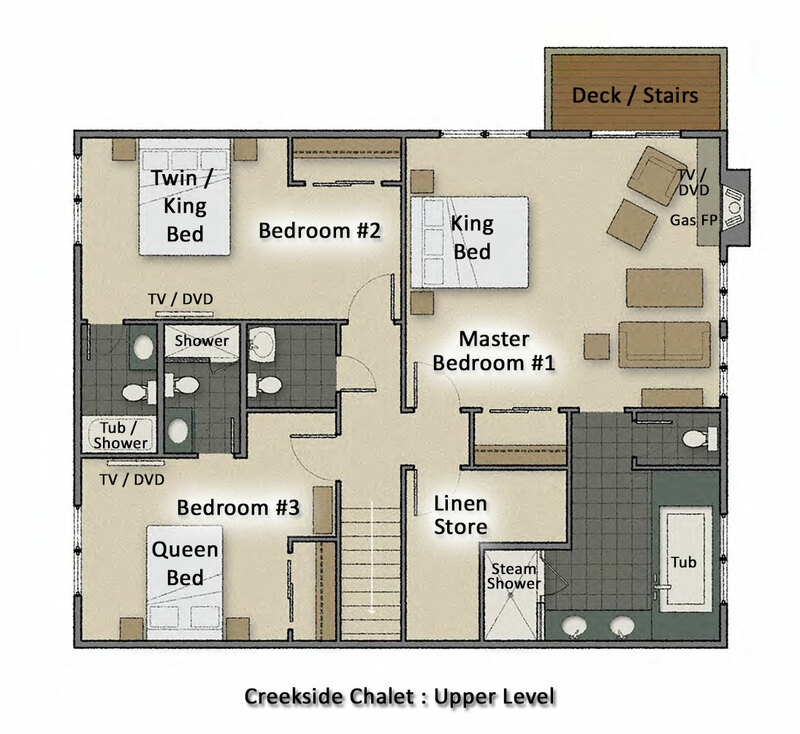 I think its also worth noting that chalets like this either dont exist or are extremely expensive if they are based within the village central. When the shuttle was required it was always prompt (within 15 minutes) and the drivers were more that willing to share their thoughts on the mountain and town which was a great help. The rooms have everything that you need with clean bathrooms and plenty of storage, the kitchen is huge and easily caters for large crowds (we had 15) and the hot tub was the ideal place to relaxe after a hard day on the slopes. All in all it was a fantastic trip, the only problem being that it has now come to an end and I am typing this email at work in australia! !